If someone steals a car with a digital license plate, the tag can be remotely changed to say that. An example of a digital license plate, now available in California. If a custom license plate or a college-themed plate isn't good enough for your car, a startup has the latest in automotive accessories: a digital license plate. A California company named Reviver Auto is first to market with this. 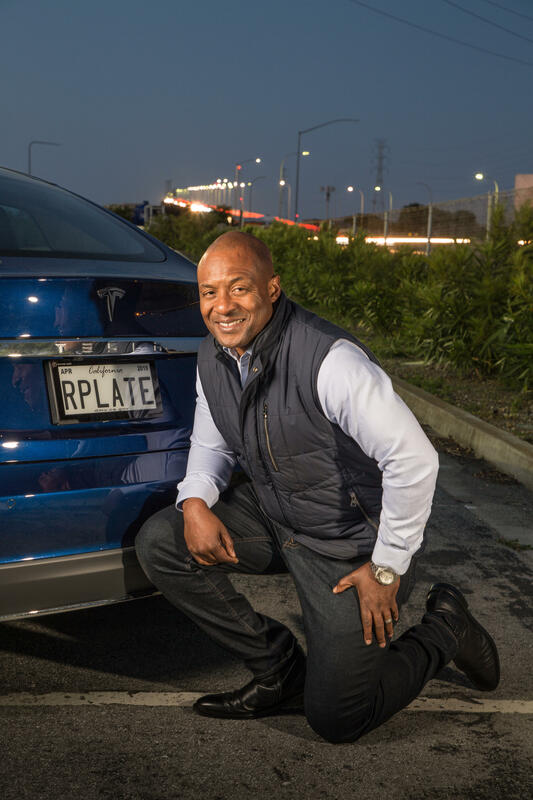 The startup's stated ambition is to transform the traditional metal license plate into a multi-functional, wirelessly connected display. Reviver's black-and-white license rectangles using "E-Ink" technology resemble an Amazon Kindle e-reader. "From the beginning it was about simplifying registration," said co-founder and CEO Neville Boston in an introductory video. "But from there, we were able to create something that was so much bigger." A driver who chooses this optional upgrade over an aluminum license plate could subtitle their license number with a personalized message, change the background with the seasons, or integrate tolling and parking fee payments. If someone steals your car, the plate could be remotely changed to read "stolen." The trick with Reviver's business plan is that it needs to go state-to-state to change license rules to authorize the product. A measure to allow the high-tech plates was introduced in the Washington Legislature on Monday. The fancy plates are available for pre-order in California and Arizona. Reviver Auto recently won legislative authorization for digital license plates in Michigan and has approvals pending in Texas and Florida. Boston, the Reviver CEO, said his company would approach the Oregon Legislature for approval next year. Reviver's pitch to state governments is that digital license plates will streamline vehicle registration and tab renewals. The plates could someday be used for emergency messaging too, for example to spread Amber Alerts or inclement weather alerts. The digital plates don't come cheap. The starting price in California and Arizona is $499 for one rear plate, plus a monthly subscription charge. By comparison, a standard replacement license plate in Washington costs $32.75 and in Oregon $29-$34. Boston questioned the fairness of such a price comparison in an interview Wednesday. "I liken it to the flip phone and the smartphone," Boston said. "You have a piece of aluminum or you actually have a smart device." Consumers, fleet managers and car dealers might be convinced to buy if they viewed the digital license plate as "a communication portal," he explained. "It's a unique tool," Boston said. "You're remaking something that hasn't been touched in over 125 years." The authorizing legislation in Washington state awaits a hearing in the state House of Representatives. The measure is sponsored by Democratic state Rep. John Lovick, who has automotive cred by virtue of his prior career as a Washington state trooper. The Washington state Senate tentatively plans to hold an informational briefing featuring Reviver Auto and the state Department of Licensing next Monday. A study prepared by the Department of Licensing at the Legislature's request last year identified a potential issue, however. The agency report said the Washington State Patrol was concerned that the digital plates might be incompatible with existing automated license plate readers, which include cameras and software that allow police to scan traffic for wanted vehicles. Plate readers are also in use on toll bridges and express lanes. Boston said his company's product has demonstrated compatibility with automated license plate readers in California.